WHAT KIND OF STAMPER IS JACKIE BOLHUIS? As we delve into the month of September, I am trying to make a few changes to my blog. I want this to be a place that inspires you, is full of QUICK & EASY stamping ideas, and a place where we can become friends! I love to stamp, I love to share, and I love to teach others! But I am a SIMPLE STAMPER! 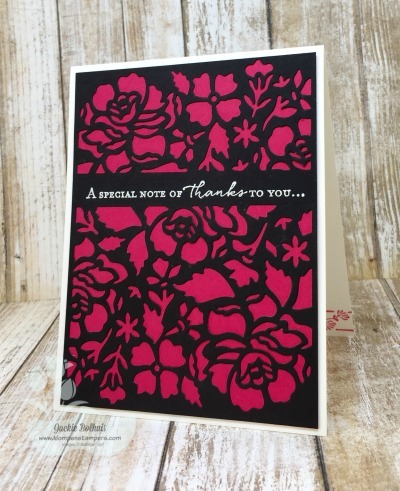 It’s time I embrace that I am a SIMPLE STAMPER and just share the kinds of cards that I like to make. 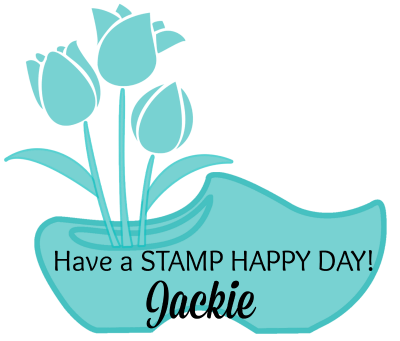 My style is CLEAN & SIMPLE and I have received so many wonderful comments from other stampers that the like the simple also. They feel like since I have been doing this for 21+ years, I am “giving them permission” to keep it simple too! We don’t always have hours to make cards! We don’t always have a million embellishments! Often the longer we’ve been doing this crazy craft/hobby, the more expectations we put on ourselves to create bigger and better things, make the cards more “foo foo,” or out-do what we see others doing. But that’s not my style, and that’s not what you will see here! 2. Making a card DOES NOT take a lot of time! If you have followed me for a while, hopefully by now you have figured out that I love to share several ideas with JUST ONE STAMP SET + MINIMAL SUPPLIES. I will continue that to be the focus of my blog, and not feel guilty for not creating and sharing “foo foo” cards! That is how I stamp! I like to make sure I can get the most out of each stamp set that I purchase. In my mind, there is nothing worse than buying a stamp set and using it once, and then putting it in it’s “resting place” on the shelf! You won’t find many “over the top” cards, projects, or 3D items here–that’s just not who I am. 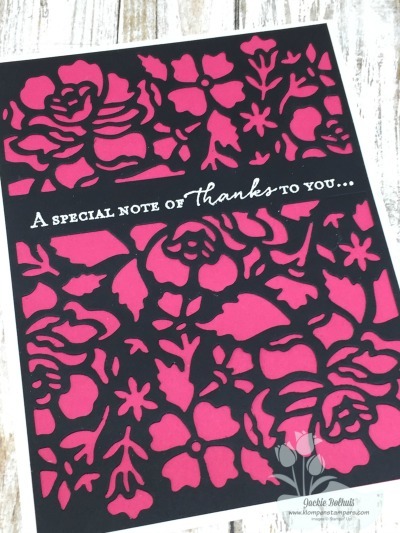 But…..If you like clean, simple, classy, stunning, and very do-able cards–you are in the right place! Each week I will focus on ONE STAMP SET + MINIMAL SUPPLIES and share at least 3 different cards with you. On Thursday’s, I will share a video. Again, the video will be “my style!” Showing you QUICK & EASY TIPS to help you be able to create QUICK & EASY CARDS! Again–no “foo foo” from me! Ok, that was a lot of “blah blah blah” but I just had to share it–if nothing else for me! will be QUICK & EASY projects! But I promise, they will be classy, stunning, beautiful cards that you will easily be able to duplicate and make yourself. OK–enough–I will shut up now and let’s have some stamping fun! 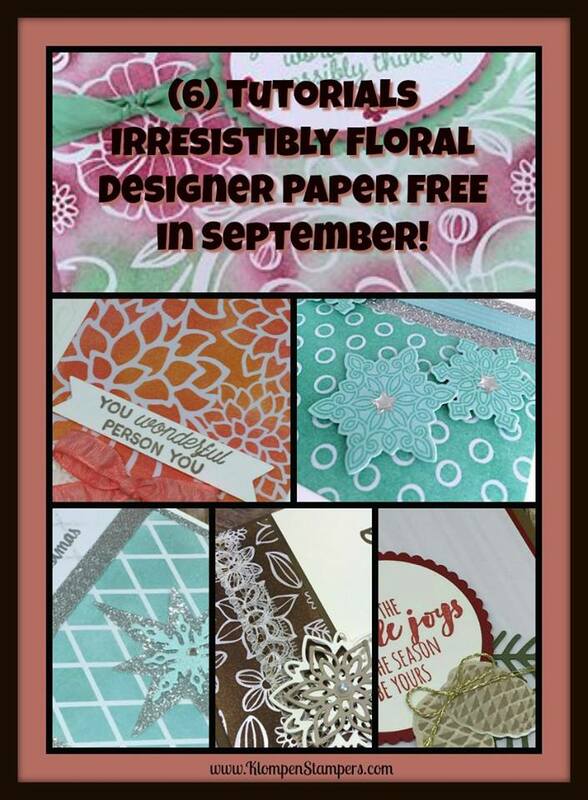 TRUE CONFESSION TIME….I did not like this bundle when I saw it in the catalog!!! I don’t like BLUE, and everything I have seen made with this bundle is BLUE!!!!! TOTALLY HAVE CHANGED MY MIND!!! 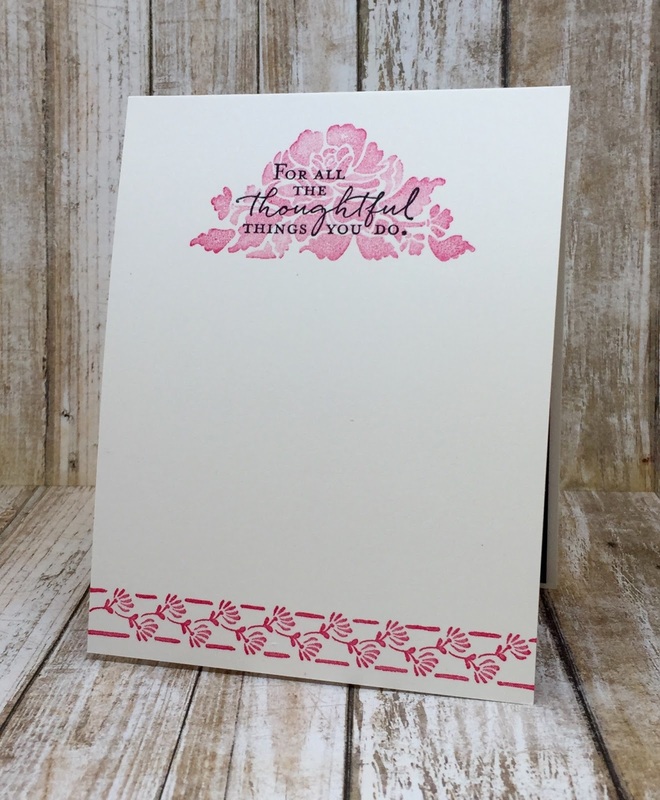 This stamp set & Thinlits is GORGEOUS and is so QUICK & EASY to make beautiful cards with. And guess what???? You don’t have to use any BLUE!!! This is how you need to cut using the dies on the cardstock for this card. Make sure the STRAIGHT EDGE is to the inside center of the yardstick. (this example shows cutting Melon Mambo cardstock, however, today’s card was cut from Basic Black! It then has a layer of Melon Mambo underneath. 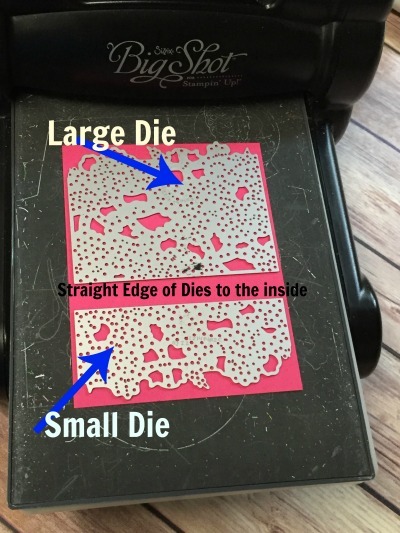 By positioning the dies this way, you will have a nice straight strip in the middle for your words! On my card today, I embossed the words in white to really made them stand out. Is the Precision Base plate DEFINITELY needed for this die? Hate to buy it just for that! I love love love your post and I really like clean and simple cards too. Thanks Debora. I am such a “clean & simple” person that was the look I was going for. Clean and simple blog to post clean and simple cards!